DonationCoder is a unique site on the Internet that was created back in 2005. It was designed as a place for programmers to share developed software and to support development through donations and not shareware sales, by advertising or other means. Great programs were created by DonationCoder members in the past. To name just a few: Screenshot Captor, an excellent screen capturing tool, Clipboard Help+Spell, a great clipboard manager, or Find and Run Robot, a program launcher for Windows. But there is more to the site than truckloads of great programs. DonationCoder hold an annual NANY event which results in great programs being released for the event. Another interesting and rather unique feature is the site's coding snacks forum in which members create programs based on user suggestions. It should be clear by now that DonationCoder is a site that we love. 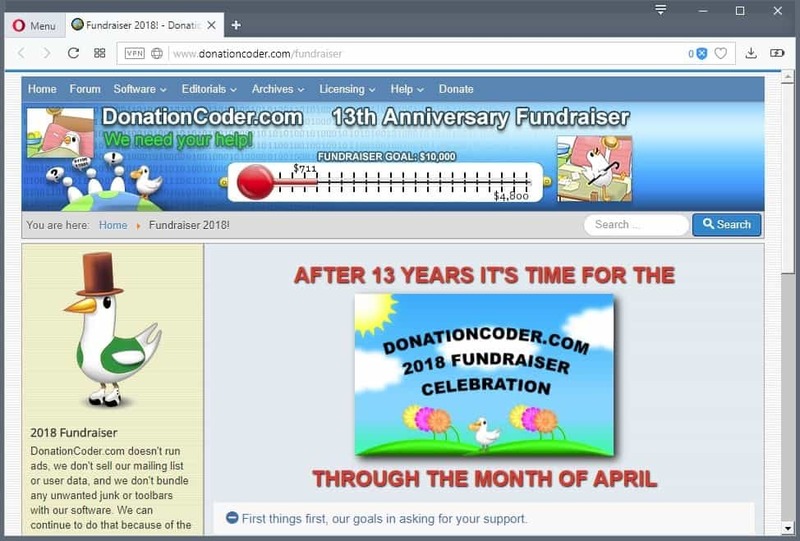 It is the 13th Anniversary of DonationCoder and the site celebrates the anniversary with a fundraiser and giveaway. The last fundraiser was three years ago on the tenth anniversary of the site. The coders try to raise at least $4800 to cover the hosting costs for the coming year. The site was moved to a new host recently which improved responsiveness, speed and other things. But first: I need to ask for your financial support and your non-financial encouragement. It's been 3 years since our last fundraiser, and 13 years since the start of DonationCoder.com. I hope we've earned your renewed support by continuing to release and update clean, quality software free of toolbars, ads, bundled software, or other unwanted junk, and by making our forum a friendly place where people can discuss technology issues and help one another. This past year in particular we spent a *huge* amount of time completing a long-awaited major overhaul of our website along with a move to new hosting servers. These changes will help us do what we do better and more securely, and help us update our content more regularly. I hope you'll show us that you appreciate our hard work by making a donation during the fundraiser. In section 4 below you'll find a new long article by me on the changes to the site, as well as a request for your input about new ideas for the site. Supporters and users who choose not to support the site through donations may enter a giveaway to win commercial software programs. Supporters who donated will get prizes first, however, and users who entered without donation may get unclaimed prizes only. The list of programs is large and it includes several high profile applications such as Camtasia, VMWare Workstation Pro, Macrium Reflect Home, or UltraEdit. The deadline for entry is April 9th, 2018. Users who sign up for the site's newsletter, sent out just a few times a year, will receive a list of software discounts for applications as part of the festivities. Now You: Have you been to the DonationCoder site before? What's your take on the site and the programs created by its members? Thanks so much for posting about our event, Martin. DonationCoder is great. I discovered them several years ago, contribute, and there is a wealth of excellent software there. I couldn’t live without Find and Run Robot!